Shopping for men can be tough! The secret is to find the happy medium between practical and original. Our felt ties put a unique twist on tradition – sure to impress the manliest of men as well as the minimalist who’s hard to shop for. Each tie is made of thick pressed wool felt, elegantly crafted and offered in a variety of bold colors and natural gray to suit any occasion. 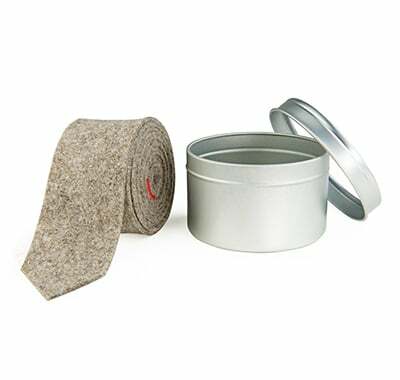 A gift for the guy who thinks outside the box, a felt tie is sure to be an instant ice-breaker at parties and holiday gatherings. Washing and maintenance: It’s safe to iron directly on low/wool setting; do not use the steam setting. Press gently to remove wrinkles after untying. Spot clean only. Please note: natural wool is used for the Natural Gray Felt Skinny Tie and the felt contains no dyes. Color variation for the natural gray industrial felt may occur. The felt tie is a classy addition to both formal and casual wear, adding a rustic touch to any outfit. It’s a unique gift that’s sure to turn heads.